You have probably seen this picture flying around the interweb. Can you hear the ‘should’? It was an expectation of how I was supposed to live my life. The message I was sending to my poor brain was: “You are not daring-brave-spontaneous-fun enough." So I started seeking opportunities to do stuff out of my comfort zone. Honestly, it brought me more stress than results. Later, when I started working with people who were looking for a change in their professional path, I noticed a similar stress pattern. Results? Stress, burnout, unhappy faces, quarrels at home. Nothing pretty, let’s keep it at that. 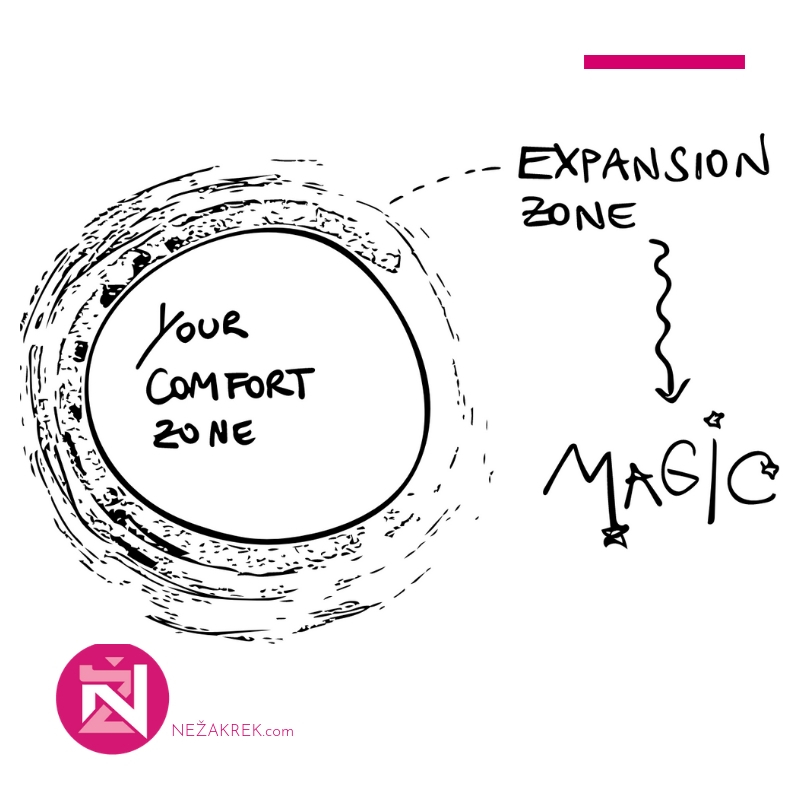 When does the comfort zone become the danger zone? At this point I wish to stress one thing. I am not saying you want to stay in your comfort zone all the time. Keeping yourself constricted to it will eventually rob you of sense of freedom, kill your inquisitiveness, your natural ability to adapt to new circumstances. Allow me to illustrate with my interpretation of a story from the first philosophy book I got from my grandpa for my 16th birthday. Gaardner’s book Sophie's World: A Novel About the History of Philosophy gave me food for thought as a teenager. Gaardner tells Sophia a story of a flea living in bunny’s fur. At first, the flea is enjoying the breeze of the wind while riding on the top of the fur. Uiiiii, it’s fun and wavy and there is such a great view! Well, it’s also a bit cold. So the flea looks down the hair and notices it is way warmer below - close to the bunny’s body. The further down it slides, the warmer it gets. Yummm, it’s so cozy. At the bottom it feels the safest. Yet, the view is gone. No more wavy sensation, no more excitement, only safety. Ah, well, you can’t have it all, goes the flea. I find this as a brilliant analogy for how we as human beings live our lives. Some decide to stay in the safety of the fur and some like to climb up to the edge sometimes to see the sun rising. The trick is NOT to stay at any of the extremes for too long. I was reminded of that when I found myself with a depleted battery after a year of working at my first ‘real job’. Sad, without a spark in my eyes, without a dream or an idea what I wanted for myself. I was afraid to let go of the salary even though it was killing me to go to work every day. I was out of my comfort zone for a whole year every day - way too long for the person I am. So, where does the magic really happen? The simplest way to put it: it happens on the rim of your comfort zone. It happens in the “EXPANSION ZONE”. It happens when you still feel safe in your own skin yet you already feel the pull of novelty. Of an exciting adventure. That is the place where your natural curiosity outweighs the fear of losing the feeling of security. In my opinion, that is where the magic truly happens. My recommendation would be to systematically stretch your comfort zone, not jump out of it straight away. How can you do that? Think of the smallest next step towards the outside of your comfort zone. If you want to attend a networking event and feel really uncomfortable with it, your first smallest next step could be asking a colleague to go with you. If your stretch would be to send out a CV, the first smallest next step could be making a list of all your achievements (small and big) you even had since your first job. 1. You are going through a process, not looking for a switch on/off button. 2. You are starting an adventure: try to keep it fun. Wear your curiosity glasses. 3. You have superpowers but you are not a superhuman: Find support for yourself. A coach, a friend, a journal. Now, I am curious about your journey. Hit comment below and let me know WHAT WILL BE YOUR STRETCH TODAY?